Discussion in 'Roadster' started by adiggs, Nov 13, 2012. As Bamashrink, I find that I'm looking at Roadsters these days. Waiting for Model X, even if I'm in line for an early one... I need to get my personal electric revolution started earlier. And for some reason, Leaf or Prius or what have you just doesn't really interest me. So I'm pondering the question - how do I own and drive a Roadster for about a year and a half (my estimate for when Model X starts shipping - I'm Sig #184), for as little as possible, while I wait for X? I figure I'll add about 7-10k miles to the odometer during that time (I don't drive very many miles, though I'm sure to find a few road trip excuses! 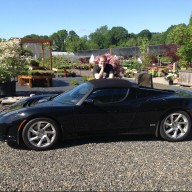 ), and complete all of the routine maintenance.- I've been able to test drive a Roadster; can you grow addicted to something in 15 or 20 minutes? Seems difficult. I figure one definite event during the Roadster experience is a day at the track for performance driving training; is that a reason to look at 2.0 or higher? I'm looking at both CPO and private sales; the extended service availability from the CPO and current lack of that in a private sale concerns me as far as resale value. Would a CPO purchase with extended service (probably not battery) pay for itself at resale time? - if you're trying to minimize the absolute difference (percent difference isn't important) between price to buy today, and what the car could be resold for in about a year and a half (with an extra 10k miles on the odometer), is there a particular variant, model year, mileage, or anything else you'd aim for? - as a potential new Roadster owner, what should I be learning about a car I'm considering buying? Other info that might help - I live in Oregon, so except for drizzle for half the year, we don't see very extreme weather. Any snow will be light, and from what I've read and seen in videos, the Roadster will handle it much better than my current car. The Roadster would be my daily driver, and we might even end up selling the current car, leaving us as a single car household (groceries!). A seemingly random question - is there a Roadster VIN translation post somewhere? I'm wondering what options or other information I can extract from a full VIN. Any thoughts to help me along are appreciated. There isn't much to extract from a VIN, other than year, and if it is a sport model or not. My gut tells me that the depreciation curve is a bit steeper at first, then settles into a slower rate, so perhaps an older 2008 1.5 might be a better deal in terms of lower entry price, and less max $ lost during the 1.5 years. It is possible that they are already entering some collector status, so appreciation isn't out of the realm of possibility. The fact that the battery pack slowly wears out over time (weather you drive it or not) does work against the possibility of it retaining full value though. You can read through the forum if you want to understand the various options (not indicated by VIN) such as carbon fiber accents, upgraded audio, etc. In terms of on the track - all Roadsters have their limits. They can all go into reduced power mode if driven too hard for too long. Not the ideal track car but still fun. The difference between the 2008s (1.5s) and later variants (2.x) isn't actually all that great. A good driver in a 1.5 can outrun a mediocre driver in a 2.x on the track fairly easily. I got a 2008 1.5 with low miles and still under warranty. I expect to take a $10-15k hit by the time its all said and done (including the hefty sales tax I had to pay, luckily you won't have that problem). One thing I didn't do when purchasing my Roadster was asking the owner to download the log and sending it to me. Quite a bit of information can be accessed through that. Also ask the owner to do a standard charge with a 110v socket to see what the ideal miles yield. Someone here in Seattle will be selling his 2.5 (White, 10k miles) very soon. Tesla offered him $79k on trade-in. That's a serious depreciation curve on a $150k car (I could be wrong on the MSRP for that particular car). Thanks for the info Teg. Actually, being able to discern Sport or not would be quite helpful for what I'm trying to do, as I figure Sport or not is probably the biggest option choice for contributing to original and continuing value of a Roadster. As for the track time, at least today, the primary idea is to upgrade my 8th grade level of driving knowledge / skill to maybe an undergraduate level Today, I'd be one of those bad drivers easily getting out run. The real point would be having some fun, and become safer behind the wheel of a much more capable car (current car - 0-60 eventually :biggrin . Thanks for the info Jackyche. If that $10-15k includes the sales tax, then that'd do the trick for me. Now I just have to find a particular car that would deliver that result for me. And I believe Washington state policy lets you make car sales to people in Oregon without charging the sales tax (best I can tell, California isn't so accomodating!). I'll remember the tip on the standard charge for ideal miles. I'll also keep an eye out for that white 2.5 - Seattle is close enough I could either get a ride up north, or take the train, and drive back.... White isn't the color I would choose if I was buying new, but it wouldn't be hard to live with either. And with a grand total of 1400 Roadster in North America, there's a limit on how picky one can be too. The badging is different for the Sport so it should be very easy to see. Also I think for the average driver there is little difference between a Sport and non-sport. At EVCCON I had a chance to race a 2010 sport in my 1.5. I won two races and the sport won two 1/4 mile heats. Neither car ever had more than a two car length advantage. If you look close at the power curves the sport reaches max torque sooner but the nonsport holds the level a little longer. Yes, a sport model is a step up from the non sports due to extra performance options with the motor/inverter, suspension, and such. If you ended up considered a very low numbered VIN (last 5 digits less than ~00040), then there are some other digits to check if it is a 2008 that was a regular production, validation prototype, or Founders' series. Some of the earliest cars were also put together in the UK, not USA, so you can also tell that from the VINs. Regular production outside of North America has a different VIN sequence but you are unlikely to encounter one of those cars here. Obviously I'm not fully intune with Oregon law, but here in WA, you pay the sales tax when you register the car with the Dept of Licensing. So you'd buy a car here, and just drive it back to OR (here in WA, license plate stays with the car). In regards to 10-15k hit, I find low mileage is the key and assuming you got a very fair price. On a 2008 1.5, going rate is about $65k with hardtop with less than 20k miles. Not really sure about other years. If you look close at the power curves the sport reaches max torque sooner but the non-sport holds the level a little longer. Yeah, I saw it first hand at a drag strip where a sport was running side by side with non-sports. The sport was fairly consistently .2 sec quicker to 60MPH, and kept that .2 advantage all the way through the quarter mile. I think people appreciated the adjustable suspension upgrade too. You could adjust shock settings to make the car firmer or software to fit your driving style. Oh, and even the non-sport's 3.9s 0-60 is quicker than needed for most situations. I think the sport upgrade ends up being more about "bragging rights" than something people really need in daily driving. And I believe Washington state policy lets you make car sales to people in Oregon without charging the sales tax (best I can tell, California isn't so accommodating!). My understanding is that if an out-of-state resident purchases a car in CA from a CA Dealer, the dealer collects the CA sales tax unless the vehicle is transported out of state by the dealer or by a common carrier (car hauler). However, an out-of-state resident purchases a car in CA from a private party, the buyer rather than the seller is the one to settle up with the State of California for the tax (called the "use tax"). A CA purchaser from a private party has to pay the "use tax" to the CA DMV. I think the Sport gives you an extra boost just at the very start of the acceleration, just as you are launching. I don't think there's any substantial difference one second into the run. If the sport is 0.2 seconds ahead by then it will stay there. The suspension upgrade is certainly worthwhile. I optioned it in on my non-Sport. However, an out-of-state resident purchases a car in CA from a private party, the buyer rather than the seller is the one to settle up with the State of California for the tax (called the "use tax"). How often does this happen? I would bet very rarely. I don't know about California. But in Washington, you settle your Use Tax during the title transfer. And for my case, it was super annoying as they didn't have a reference price to go with for the 08 Roadster and they won't take the price on the bill of sale (from private party) to charge the sales tax. At the end, I had the seller sign some affidavit of the vehicle price and condition. Either that or pay the NADA price tag sales tax. Thanks for the VIN info TEG - that's all very clear and what I was looking for. I bought a 1.5 in Portland recently. I live about 40 miles south of you in the Cascade foothills. I've put 2k miles on it, and I can safely say that if it was a Sport I wouldn't realize the slightly better performance very much. The 1.5 is already in need of more traction just to be able to use the power it has. The slightest bit of wetness on the road really kills traction. It needs the stickiest tires it can get. I did find some good winter tires at Les Schwab, and the car is well mannered in the crud. I'll be driving it in everything short of ice/snow. Prices have come down about 5k since I bought mine only two months ago. Many Roadster owners are selling to finance their Model S purchases. This is making for a buyers market. I don't see that changing soon. I too was thinking that I would eventually replace the Roadster with my S when it arrives. I'm thinking I might wait for the X and take the extra time to save up and have both cars. They're really very different, and having driven my Roadster for 2 thousand miles already, I don't want to give it up for anything! I live on a grade at 1000', so I'm pretty sure I'll want the 4WD in the winter. That's good to know 'bill. I've been assuming I'll need all season tires for the winter time. As you, the Roadster will be my ride, so it has to get about in the wet. Your sense of the market is also mine. I figure there will be at least 1-3 months like this, and then the market will start tightening up again (all depending on how quickly the backlog of Roadsters find new homes). But then there's the kW power gauge on the dash, the more comfortable seats, the location of the VDS (arguable which is better), better PEM cooling, better air conditioning (rumored), more logical wiper control, and the push button drive selectors. OTOH, the early 1.5s have a full carbon fiber trunk, a retro stick drive selector, carbon fiber center thingy, and more elegant front end styling. You can also upgrade the 1.5/2.0 rear diffuser to carbon fiber, which you can't do with the 2.5s. Are the 2.5s worth the extra money? Hard to say. If you're buying to drive, maybe. If you're buying as a 20 year collectible car investment, probably not. I used to own a Jag E-Type. What was interesting there is that the car got better each year until 1967, when the Fed government forced them to change the headlights to sealed beams, which ruined the lines of the car. A few years later, Jag went to a V-12 engine from the straight six, which on paper was better, but in the real world was a pain to keep in tune. So 1966 or early 1967 models were the most desirable - neither the first nor the last made. I had a '66. Now that the first cars are over 50 years old, there's more appreciation for the very first ones with the aluminum dashboard (very bad in a convertible with strong sun behind you!) just because they were the first. With Roadster, however, it's harder to claim that the car didn't get better with each generation. And, now that you can get factory upgrades to create your own set of features, my guess is that both the very first ones (Founders? Sigs?) and ones with all the options (2.5s with upgrades) will have the most value - but that's just me guessing and any number of things could happen to change what the market in 2040 thinks is the coolest version of the car that started the electric revolution. Assuming you're buying to drive the thing, I'd advise at least a 2.0 - the kW gauge is really worth it. But, I'm weird like that. fwiw, 2.0's at least until VIN 561 had a "full carbon fiber trunk"
Mine's #670 and it also has a full carbon trunk. I have been a 1.5 owner for 18 months now. And while I agree the 2.0+ goes for more money and have some nice features like the sound proofing and the KW meter on the dash, I beleive there are a number of advantages of the 1.5's. My understanding there was some significant decontenting that went on from the 1.5 to the 2.0 as Tesla desperately needed to be cash flow positive on the cars. •	More robust PEM (also weighs 45 lbs more) with better cooling from internal fan (according to 3 Rangers), a second plus of the 1.5 fan location is very little dirt or trash is picked up keeping the PEM cleaner and allows it to run cooler. Some differences that have pluses and minuses in my opinion are the position of the VDS. While the center position is great for passengers to see, I love being able to set the charge time or rate or see the state of charge easily without having to climb in the car. While a lockable glove box is nice; it has 1/3 the room of a 1.5 dash tray. I agree the KW meter in pace of the tach and the sound proofing are two nice positives of the later models. The sound proofing can be added and to me it makes the car feel MUCH more refined. I have been told the dash instruments cannot be upgraded. So after owning a 1.5 for more than 13,000 miles now and adding the sound proofing, I have yet to yearn for a later model.